Within each species there are often freakishly strong and powerful aberrations born through seemingly blind chance. Successful servants of chaos can find their bodies shifting and growing as these latent traits are brought out. 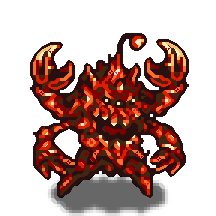 The Hell Crab is a powerful example of the potential all Evil Crabs carry inside them. Last updated on Sat Apr 20 01:37:30 2019.